The credit crisis caused a shakeup in auto lending last year. The large banks, awash with cash from federal aid programs, and credit unions, which avoided the losses linked to bad loans, stole market share from the manufacturers' auto finance arms. Now, as credit eases, the captive finance companies are taking back some business with aggressive lease programs, in particular. The latest market share data from research firm Experian Automotive's AutoCount reveals a tug of war for market share. "We are under no illusion of continuing the large share we had last year because competitors will come back into the market," said Marc Sheinbaum, CEO of Chase Auto Finance. "The downturn forced some captives to pull back, which created an opportunity for noncaptive lenders like Chase. We expect competition to re-emerge as the economy and sales recover." Chase Auto Finance pushed Toyota Financial Services out of the top spot in 2009; but with aggressive leasing programs, Toyota edged ahead of Chase in the fourth quarter. Chase returned to the lead position in the first two months of 2010. Wells Fargo Dealer Services -- formerly Wachovia Dealer Services -- ranked third in 2009, drawing on its strength as a used-vehicle lender. But in the fourth quarter and in the first two months of 2010, it slid into fifth place. GMAC Financial Services, which ranked fifth last year, took the third place ranking from Wells in the fourth quarter and early this year as its access to capital improved. A big factor in GMAC's rise was an increase in lease volume. Chase and GMAC also added preferred lender agreements with auto manufacturers that propped up their market share. Chase took on Land Rover, Mazda and Jaguar; GMAC added Chrysler. "We expect that our market share in 2010 will definitely be higher than 2009," said Tim Russi, executive vice president for GMAC's North American Operations. "We quickly ramped up retail financing and have been increasing our business every quarter." During the credit crisis, banks and credit unions used their access to capital to an advantage. Many banks tapped federal aid programs, and credit unions avoided the risky loans that troubled other lenders. Navy Federal Credit Union, which jumped to No. 23 in 2009 from No. 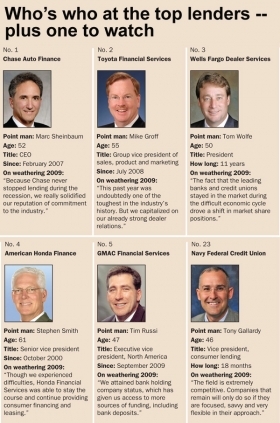 30 in 2008, has $39.6 billion in assets and committed $3.5 billion to auto loans last year. "We never got involved in risky investments," said Cutler Dawson, the credit union's president. Regional banks such as SunTrust and Huntington Bank climbed in the rankings. Fifth Third Bank, also a rising star, has been expanding its territory. It now has banking centers in 34 states and is entering two more: New Mexico and North Dakota, said Kaari Link, Fifth Third's national accounts manager. Though these up-and-comers recognize they face growing competition as liquidity for the captives improves, some believe they will retain the business they built during the downturn. "I expect that the captives will regain some market share," said Tony Gallardy, vice president of consumer lending for Navy Federal. "But if we do our job, we will be able to hold on to most of our increased share."